Bob Bowman, a native Kansan, learned to play the piano and clarinet before beginning to play bass at age 12. He won a scholarship to the Stan Kenton Jazz Clinic as a high school freshman, followed by study at North Texas State University. In 1976, he joined the famous Thad Jones/Mel Lewis Orchestra, touring and recording several albums, including the Grammy award-winning “Live in Munich.” Bob continued his performing and recording career by joining the Toshiko Akiyoshi-Lew Tabakin Big Band in Los Angeles in 1979. He recorded numerous albums as a member of this band, many of which were nominated for Grammy Awards. Bob also had long musical relationships with pianists, composers and arrangers Dan Haerle and Frank Mantooth. Bob has toured and recorded with many artists including the legendary Carmen McRae, Pat Coil, Freddie Hubbard, Bud Shank, Karrin Allyson, Steve Houghton, Steve Allee, Bill Mays, Clay Jenkins, Danny Embrey, Todd Strait, Bob Sheppard, Matt Otto, Rod Fleeman, John Stowell, Jerry Hahn, Bobby Watson and others. Also he has had a very important musical relationship with Kansas City musicians like Tommy Ruskin, Paul Smith, Mike Ning, Claude “Fiddler” Williams, Jay McShann, Stan Kessler, and many more. Bob moved to Kansas City in 1988 where he has been a major part of the vibrant jazz scene there. He was a faculty member of the University of Missouri as well as Ottawa University and leads legendary Kansas City group INTERSTRING and various version of Bowdog. Bob now lives in Montana where he first visited when he was 5 years old, enjoying playing music and the beautiful country year around. He travels back to the Midwest every 2 – 3 months to perform and record. “Very deep jazz history and great musicians in Kansas City that keep me coming back.” Bob says. Bob Bowman’s solo on a ballad on Danny Embrey’s Dues Blues is as life-affirming as a poem by Maya Angelou. The bassist’s concise statement on “November” is one of many standout moments on the welcome reissue of the guitarist’s 1988 recording with Bowman, keyboardists John Beasley and Dave Loeb and drummer Steve Houghton. Bowman, a native Kansan, explored the jazz scenes on both coasts and toured the world with heavy hitters — the Thad Jones-Mel Lewis Jazz Orchestra, the Toshiko Akiyoshi-Lew Tabackin Big Band, singer Carmen McRae — before deciding to settle down in Kansas City in the late ’80s. A few years later, Allyson came along and took him out on the road again for at least a decade. But he never left for too long, and the last few years, Bowman has devoted himself to being closer to home — family, friends and his horse. Since the ’80s, he has made himself one of the central figures of the Kansas City jazz scene. He has helped many younger players get it together, and by his own playing he has raised the bar for what’s expected of bassists and rhythm sections in this town. Now, emerging from this difficult period, he has raised the bar for himself. And we all get to enjoy the results. A dexterous vocalist, Allyson sang the Allison material with irascible grit and applied sanguine assurance to “Sous le Ciel de Paris.” Like Allyson, Bowman seems to be improving with age. 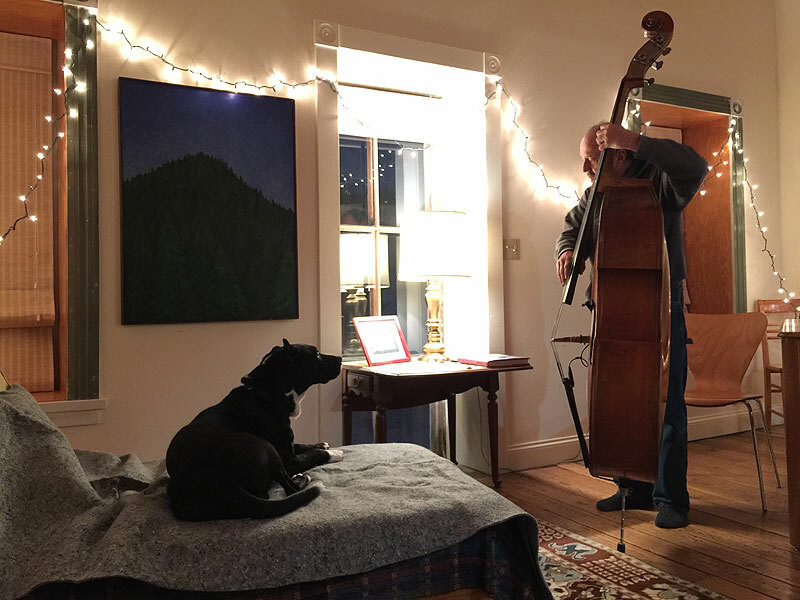 The bassist stood out among the masterly accompanists. The high ceilings and pristine sound field transformed the tone of his instrument from an indeterminate pulse to a multi-dimensional dynamo. Bowman may never have sounded better.